As my uncle says, "there's always the phrase that you can never be too rich or too thin." The point is that being healthy and wealthy go hand in hand. How can one save money and make smart money choices when they are unhealthy, stressed out, and depressed? In the same way, how can one make the change to be nutritious and exercise if they are loaded down with debt and juggling numerous jobs? This book attempts to answer some of those questions. With calorie-counting tips, advice on what types of foods to eat, motivation for exercise, budgeting charts, information on buying cars, analyses of savings plans, and more, this book aims to help the common reader get in shape and get in a better financial state. There is an emphasis on positive thinking in this book. Psychology techniques are implemented as the authors tell the readers how to get past temptation, avoid bad thoughts, and focus on the truth of their goals. This book is not written by a nutritionist or a financial adviser, so do not expect recipes, exercise diagrams / instructions, or counseling on your particular financial-life situation. 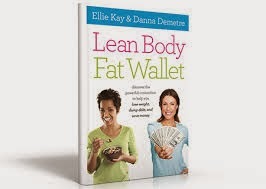 Rather, this book is written by two women who stay healthy (per their definition of healthy) and are happy with their financial situations (also per their definition of wealthy). There is even a section of raising fit and frugal kids. What's nice is that this book has a refresher section in the back with quick bullet points of what each chapter was about. So, if you put this book down for a while and forget some details, you'll be quickly filled in.